Meet Mr. Jenkins. There are references to a Robert Jenkins, Vestryman of Christ Church, Boston and merchant of Salem, MA and Newport, RI. A Robert Jenkins married Elizabeth Champlin of Newport, and we have a pendant portrait of Betsey Jenkins, suggesting stronger ties to Newport. The records are confusing, but one thing is clear: that’s his waistcoat and he’s happy to have you see it. 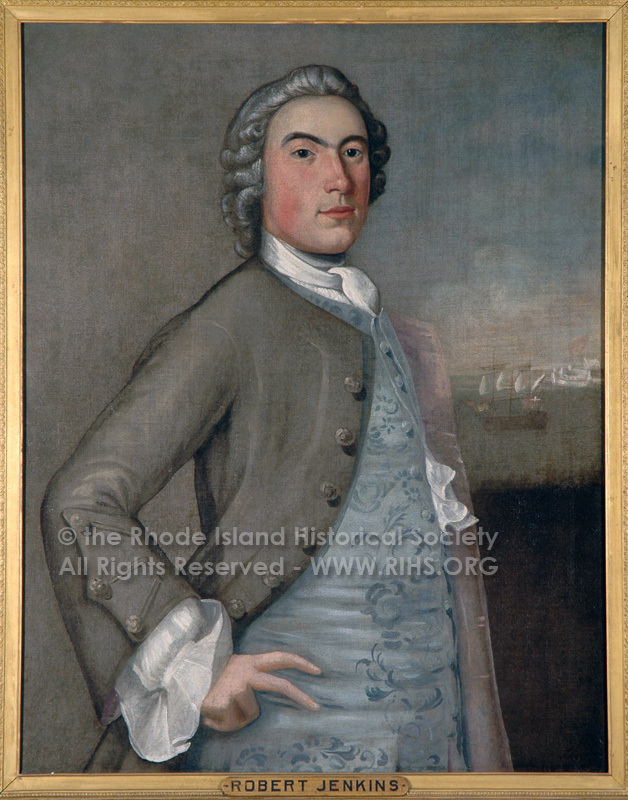 This 1748 portrait by John Greenwood shows a man associated with a port city, perhaps connected with shipping and mercantile trade (see the ships in the background), and who has made enough money to a) commission a portrait and b) either own that sweet silk velvet waistcoat or to have one painted. It is entirely possible that he owned it. And it probably looked a lot like this 1750-1755 one from the Met, but without the sleeves. There is fragment (two fronts) of one very like this in the collection at work. It’s not Robert Jenkins’, but it is Rhode Island, so we know these kind of garments were available and worn. The last piece to track down would be an account book, to get some idea of what this might have cost. What I like in particular about the Met’s waistcoat is the cuff detail. The sleeve, which would be heavy if fully made of velvet, is not. Only the cuff is the velvet, while the sleeve itself is lighter weight silk.